Yes friends, we were the first to tell you that the Chevy Volt would be wending its way around town underneath the skin of old, dead Malibus back in September. Now we're the first to show you a picture of a Chevy Volt wending its way around town underneath the skin of an old, dead Malibu. Also, we were like, the second to bring you that Volt video a few weeks ago. So we've got that going for us too. Oh, and then there was that production shot of the Volt we saw at the end of last year. One more feather for the drips-and-dribbles from the General hat. Full spy report from the pride of Brenda Priddy's pride of spy photographers, Chris Doane, below. Jalopnik Interviews GM Vice-Chairman "Maximum" Bob Lutz ... No, Seriously! Today we have the first rock solid evidence that the Chevy Volt has begun development. Hiding under a previous generation Malibu body, we saw GM starting to run the E-Flex powertrain through it paces on the track. The General will hope to have the Volt on sale in late 2010 as a 2011MY car. However that timing will depend on how well the Lithium Ion batteries development progresses. A task given to Continental Automotive Systems and A123 Systems. It could very well be a 2012MY car by the time Volt's start rolling down the production line. 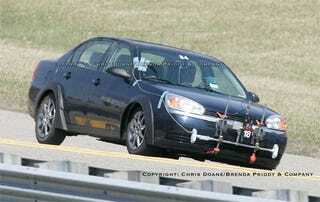 One thing we do know for sure if that the Volt will be riding on the next gen Delta chassis. This next gen chassis is also know as GM's "Global Compact Car Architecture." According UAW documents, GM seems set to build the Volt at their Hamtramck plant once the G-body Buick Lucerne and Cadillac DTS cease production. Price wise, GM was hoping for an MSRP of around $30,000. It now seems that number may be closer to $35,000. Photo Credit: Chris Doane for Brenda Priddy & Co.